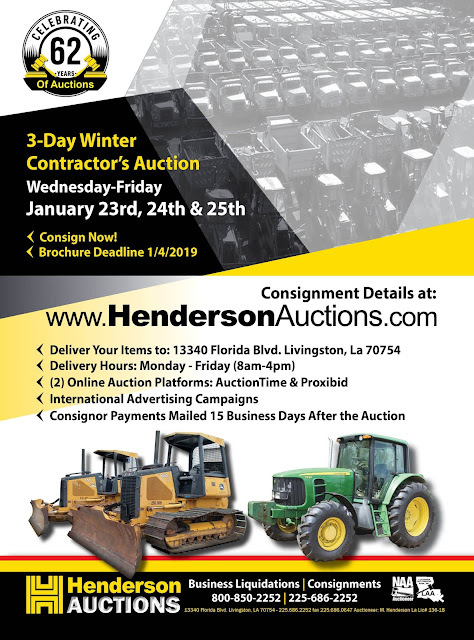 Sell Surplus Heavy Equipment, Trucks, Trailers, Farm Equipment, Autos/Pick-Ups, RV's, Boats at Auction and Make Money Fast!! 1) Deliver your items to 13340 Florida Blvd. Livingston, LA 70754 (Monday-Friday 8am-4pm). 2) Yard personnel will assist with unloading your items, you will be given a ticket/contract, this ticket/contract number will be added to your auction items. Please make sure the ticket writer is aware on any outstanding qualities or faults in your equipment. exposure in the auction industry, we market your equipment on a global level. 3) Upon delivery to our yard the consignor’s auction items are photographed, and some items will be videoed, then added to our website www.HendersonAuctions.com. Friday, January 4th at 4pm CST...so bring your items NOW to the Livingston Yard. 5) The consignor’s equipment is then uploaded to Machinery Trader, Truck Paper, Tractor House, Rock & Dirt, Mascus.com, Machinio.com, Cranenetwork.com, mylittlesalesman.com, proxibid.com and more!!! 6) Henderson Auctions utilizes (2) online auction platforms: AuctionTime & Proxibid, this gives your equipment added marketing and pushes the sold price up by Twenty Percent (20%). Forty percent (40%) of our auction total is sold ONLINE to world-wide buyers. 7) Consignor payments are mailed fifteen (15) days after the auction.